Ice Wraith Teeth are dropped by ice wraiths. It is categorized as a rare ingredient, meaning that most apothecary merchants have a 21% chance of carrying 1-4 samples. In addition, it may be randomly found only in rare-type apothecary's satchels. One sample of ice wraith teeth is always dropped by an ice wraith. 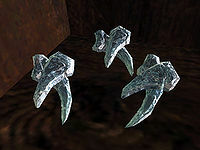 Ice Cold: Find five ice wraith teeth for Marise Aravel. 5 samples are needed for this quest.